Wild Atlantic salmon returns are being reported as poor in many North American rivers. 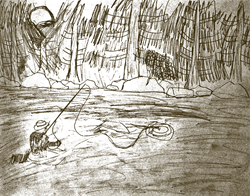 This sketch by Carson J. Becker of Harpswell, Maine was the grand prize winner of ASF's recent Young Artists for Conservation contest. The sketch will be featured at all ASF dinners this fall. A silent, live and online auction will be available with items such as an exclusive retreat in New Zealand. The Atlantic Salmon Federation (ASF) is gearing up for the annual fall run of North American fundraising dinners. Every year, the dinners represent a significant portion of ASF fundraising efforts with monies raised going to support the restoration and protection of wild Atlantic salmon. This year is of particular importance however, with poor Atlantic salmon returns being reported in many North American rivers. This fall, dinners will be held in St. John’s (Newfoundland), Saint John (New Brunswick), Montreal, and Ottawa in Canada and Chicago and New York in the United States. Event organizers say each dinner will host both a silent and a live auction with some once-in-a-lifetime opportunities for bidders. The fall run will conclude with ASF’s largest fundraising dinner in New York at The Plaza. A silent, live and online auction will be available with items such as an exclusive retreat in New Zealand which includes four nights of accommodation for two at the winning bidder’s choice of two properties from Kauri Cliffs, Cape Kidnappers or Matakauri Lodge in New Zealand. For more information on any of the ASF dinners, please visit: http://www.asf.ca/events. To view this story online, visit: http://asf.ca/poorer-than-usual-returns-intensify-wild-atlantic-salmon-co.html. Join us on facebook: https://www.facebook.com/AtlanticSalmonFederation Twitter: https://twitter.com/SalmonNews. For high-resolution photography, please visit: the ASF Image Gallery: http://www.asf.ca/images.html.